I have been a busy little rabbit this month. 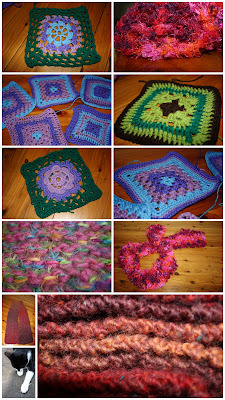 In between assignments for TAFE and going to work, I have managed to squeeze in a smidgen of woolly goodness. I have been fantasising deeply about one day having a little online Made It store or a little Etsy store of my very own – to sell scarves and other bits of woolly goodness. So I have been knitting away making these fabulous looking scarves, hoping to create a stockpile for selling. Problem is, I fall in love with the awesome colours and the feel of them and want to keep them for my selfish little self. Maybe I will have to make two of each of the ones I have particular crushes on. For example the one located in the fourth picture down on the left hand side of the mosaic. It is totally fabulous – I want to get married in a blizzard wearing it that is how much I love it. I’ve also been learning some new granny squares from this fabulous book. 1. I didn’t have to to my speech on a contemporary Australian Human Rights issue this week. However, I have to go first on Tuesday. I am completely unprepared. 2. I think yesterdays blog post was pretty awesome. I also created a forum at Nerdfighters to see what other people had to say about it. Thank you Frankie for the awesome questions. 3. I made the most delicious roast chicken on Wednesday night. The recipe can be found in Jamie Oliver’s cook book – The Ministry of Food. While it was cooking the house smelled amazingly edible. 4. I watched one of my all time favourite movies – Dirty Dancing. I completely and thoroughly enjoyed myself. 5. My cat Finn and I took a lovely nap on the couch together after working our little butts off doing the laundry and weeding the garden. 6. I’m still reading The Time Traveller’s Wife (slowly, because I’ve got to squeeze study and homework in somewhere), I think I am a little bit in love with Henry. 7. I got a package in the mail from my awesome friend. It has Star Wars Pez. I promptly wrote her a reply on cute stationery and skipped like a doofus to the post box and sent it on it’s happy little way. Mail is fun. More fun than e-mails. How glorious to exist, a cloudless sky a glowing golden sun beckoning me to bathe in its glorious sunny golden love. Even I am envious of me. I am loved by two of the most adorable furry fellows to grace the planet, one of the two legged variety (who is so unfortunately at work in an office building) and the other of the four legged variety (who is also basking in the sun, like a furry lizard. In between his crazy spasmodic runs from one side of the yard to the other). I suppose your wondering why I haven’t blogged in a few weeks, (see I’m envisioning a blog read by hundreds here, but in reality I think one person really. So a big shout out to my friend Renay, thanks for coming!!) well to tell the truth life and a cartoon series got in the way. Yes I did say a cartoon series. 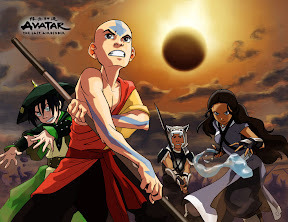 Avatar The Last Air Bender, if you haven’t seen this series I recommend it. You don’t even need to watch it with your children because it’s just that good. I’ve been gardening like someone on destruction pills. I have been pruning and removing and eradicating and just destroying this garden. It sounds so violent, but it needs to happen. To make room for the good plants and to let the sun into our super cold little yard of mud and mould and slime. It is slowly working. My two legged furry guy even got in on the action and dug out a HUGE tree stump. What a man!! Check out my pile of pruning’s. But apart from the destruction I’ve been taking cuttings and taking care of little seeds that I planted. Some have germinated. I’ve been so very domestic since moving in with the Man. Doing laundry, I don’t even know why but there is something satisfying about not letting him do it. Cooking some fabulous creation every night for dinner, then washing our dishes. Arranging and rearranging the food in the pantry, putting things in containers and canisters. I like it. Making tea in a tea pot and drinking it from a delicate tea cup like a real lady, is satisfying. Sitting around starting new crochet projects when I still haven’t even finished the last. But I am seriously loving just working with some different coloured yarn for a while. I am also making the squares slightly bigger this time and am researching new joining methods. Buying the continental recipe sachets, making it once then trying to make it again but without the sachet and making something that tastes even better. Something fresher without thickening agents or preservatives, with super amounts of fresh vegetables and flavour exploding into every corner of your mouth. I think I’m finished now. I think I might crochet or start reading Anne Of Green Gables.